Creating Payroll Software since 1985. Holidays Act & KiwiSaver Compliant. Why choose FiveStar Payroll Pro? An Established Payroll Program! With over 30 years of payroll software experience, we released FiveStar Payroll Pro in 1999, and clients who started using it then are still enjoying it's benefits! Questions Answered! Payroll Pro has evolved to become extremely easy to use. Just about any question you might have is answered on our website, and to make things even easier for you we have a number of tutorial videos available (only a few minutes each) which explain setting up, processing a pay run and more. Great Value! Some payroll providers charge a "per employee, per pay run" fee, which sometimes sounds cheap, but can actually end up being quite expensive. Payroll Pro starts with a very affordable annual licence fee covering up to 30 employees. No Extra Cost for Updates! You do not have to purchase new software or pay any extra when program updates are available. And it is easy to update Payroll Pro with a click of the mouse! (some payroll companies charge extra for updates). Written specifically for New Zealand businesses! Payroll Pro does not try to cover the requirements of overseas payrolls - we concentrate on New Zealand only, in particular catering for small to medium sized businesses. Quick and Easy! 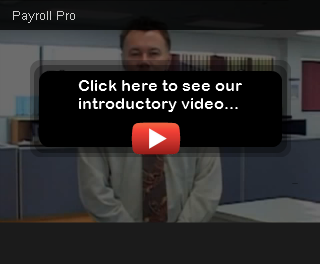 Payroll Pro allows you to process your pays quickly and easily! Payroll Pro also takes care of Holiday Pay, Sick Leave and other leave rates. You will never need to worry about calculating holiday pay again! Payroll Pro automatically calculates all the rates required. Final Pays are calculated by just ticking a box! Just tick the 'Final Pay' box and Payroll Pro will calculate all the annual leave due. Payroll Pro simplifies all aspects of your payroll from recording all leave, to uploading your IRD returns and electronic banking. Your Data on Your Computer! Payroll Pro is installed on your computer - feel safe with the knowledge your data is kept on your own computer, and is not "out there" on the internet. Of course Payroll Pro has an easy data backup function so you can backup to a flash drive or other external backup. and trial it FREE for 3 payruns If you decide to purchase Payroll Pro you can simply enter a Licence Key which will allow you to continue using the information you have already entered during the evaluation period! (2) Have a look at the following pages, and then download a copy of Payroll Pro. For Videos (1 to 4 minutes each) click here. If you are an existing user, you might want to look at the support pages. Employees can be identified numerically and alphabetically (by use of an alpha key of up to 10 characters). Codes for allowances, deductions and departments can be defined with up to 4 alpha numeric characters. Eg Travel Allowance could have the code TRAV. Allowances, deductions and departments can be given descriptive names of up to 30 characters. Pick Lists - When entering an allowance, deduction, or department, a list of available items can be displayed in most areas allowing the user to easily select the required item. This avoids having to memorise codes. Employee Notes - Three separate areas are available - a section for general notes, an area for holiday and leave notes, and a third area for a payslip message. Sick Leave - Can be recorded in days or hours. (Cannot have some employees on one and some on the other, but can have fractions of a day eg 0.1 or 0.25 etc). Holiday Pay - Can be recorded in days or hours. (Cannot have some employees on one and some on the other, but can have fractions of a day eg 0.1 or 0.25 etc). Alternatively, some employees can be put on a simple percentage method (eg 8% or other, of gross). A pay history is kept for employees and departments (along with allowances and deduction totals for each pay run). Check Pays - Before updating your totals, a report can be printed summarising the total hours, gross pay and PAYE for each employee who has been set as ready to be paid. This also shows the employees tax code and pay frequency to help avoid errors. Status - A current status is available so that you can immediately see how many employees are defined in the payroll, how many are active and how many are ready to be paid. Undo Update - An option to undo the last updating of totals is available to make error correction relatively easy. Comprehensive reporting is available, with most reports giving a number of user options depending on the information required. A number of different payslip options are available. Password protection with up to two levels of passwords is provided.